This health program transforms children’s lives — so why aren’t more in NC using it? If you are a parent or guardian of a child who receives North Carolina Health Check, or you provide medical services to children with NC Health Check, chances are you have interacted with EPSDT. The Early and Periodic Screening, Diagnostic, and Treatment (EPSDT, for short) is a mandated guideline that works to ensure children receive the care they need when they need it. EPSDT requires states to cover a broad array of medically necessary and rehabilitative services for children under the age of 21. Successful implementation of EPSDT is a component of a robust preventative care model that recognizes how to address child health priorities and social determinants of health. However, parents and caregivers, as well as medical providers need more information about how to take full advantage of EPSDT. Unfortunately, this lack of information translates into low utilization rates. In 2016, only 57 percent of children eligible for EPSDT in North Carolina received at least one initial or periodic screening. 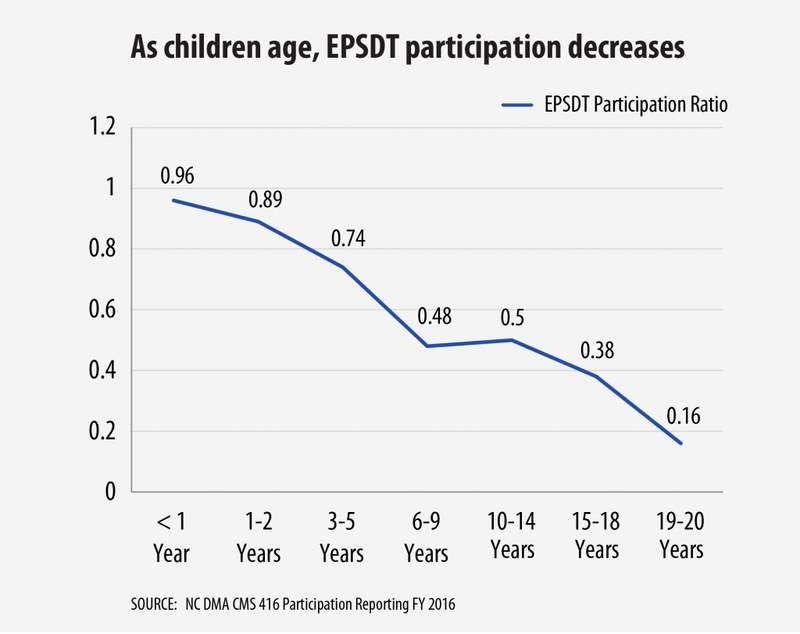 What’s more, utilization of EPSDT greatly decreases as children age. By the time children reach adolescence (ages 15-20 years), less than one-third of eligible children are receiving some kind of EPSDT related screening. A recent report from the Budget and Tax Center and the Health Advocacy Project provides an overview of North Carolina’s EPSDT program and examines the effectiveness of the program as it relates to identified child health priorities and social determinants of health. By highlighting best practices at both the state and national level, the report offers practice and policy models for how EPSDT delivery can be improved or modified to address social determinants of health and ultimately improve child health outcomes. North Carolina has several child health priorities including asthma, physical activity and nutrition, and depression, anxiety, and toxic stress. These health priorities are discussed within the context social determinants of health such as housing, neighborhood characteristics, and adverse childhood experiences. When used correctly, EPSDT is well-equipped to manage and improve child health and well being. EPSDT also allows for community-based treatment and care coordination, which greatly improves continuity of care and health literacy. Currently, EPSDT delivery can be improved so that a higher level of preventative care is delivered to North Carolina Children. Looking forward, North Carolina faces a unique opportunity with plans to transform health care and social service delivery. State leadership is working to transition North Carolina’s Medicaid system to a Managed Care model. This allows for an opportunity to establish a health care delivery process that is preventative, cost-effective, and patient- and community-centered. Furthermore, North Carolina’s Section 1115 Waiver Application includes language to address social determinants of health such as housing, transportation, food insecurity, and toxic stress.